I got bit by the magic bug just after I turned 7 years old. My inspiration was the Chicago magic icon Marshall Brodien. Marshall became known in Chicago for playing “Wizzo the Wizard” a magic clown on WGN’s Bozo Circus. His reputation grew when he ran local television commercials pitching his T.V. Magic Cards. He was instantly successful, at least with me, I saw the commercial in November of 1969 and by Christmas I owned a deck. It’s not surprising that Marshall’s commercial was so effective, Marshall was a highly skilled carny pitchman with a knack for drawing in curious bystanders. 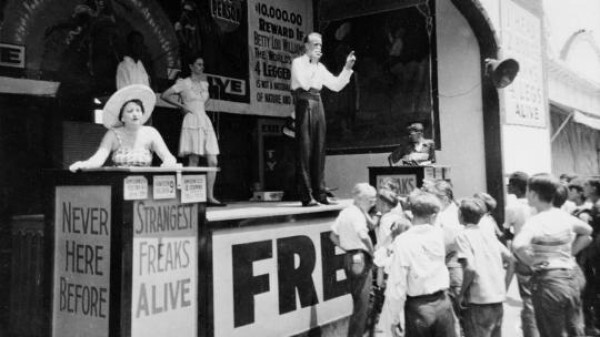 He honed his skill as a sideshow barker at Chicago’s Riverview Amusement Park. Marshall’s job was to stand on a platform out in front of the sideshow entrance and lure fairgoers inside. Standing on his platform, or ballyhoo, he relied on his voice and his ability to instantly develop a connection with a passing crowd. I recently met photographer Peter Lekousis at a party. Peter grew up in Chicago going to Riverview every summer with his family. He said that even in the 50’s and 60’s, Marshall’s era, Riverview already seemed like a throwback to the 1930’s especially with its “freak show” exhibits and their accompanying hand painted canvas banners filled with lurid imagery. I met Marshall at a magic convention forty years after first seeing his T.V. Magic pitch. I told him that thanks to his T.V. Magic Cards, I got interested in magic and became a professional magician. Marshall leaned in close and said: “Let me apologize for ruining your life.” He then invited me to his house where I saw his amazing collection of photos and artifacts from Riverview, The Bozo show and T.V. Magic. No apology necessary, Marshall. I’m grateful that you lured me into the sideshow.